With hydraulic systems, one of the fastest growing segments is compression moulding presses, as most of the traditional metal parts are now being manufactured from composites. Compression moulding is a way to mold composites using heat to cure the materials. The materials are mostly preheated and placed in a preheated mold cavity to a set temperature. The mould cavity is often heated through heated platens on a press. The mold is closed and pressure is applied to force the material to spread in mold areas. Heat and pressure are maintained to varying degrees, until the molding material has cured. Santec designs a wide range of compression molding presses with a variety of performance packages to suit customers' needs. 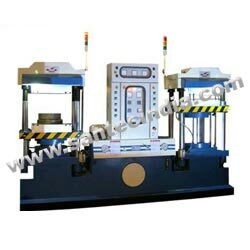 All the presses are designed with the ability to be integrated into any molding application. Hydraulic presses are engineered to optimize the process of compression molding.